Insurance is among many industries forced to change their operations to meet growing customer demands and industry regulations. While many have made progress and worked to automate their processes, there is more to be done. To combat this issue, TIBCO Cloud™ Live Apps fosters digital transformation by providing a quick solution that extends existing systems and doesn't demand IT skills. Instead, Live Apps empowers citizen developers to create smart applications through low-code application development, allowing insurers to meet growing demands and excel. 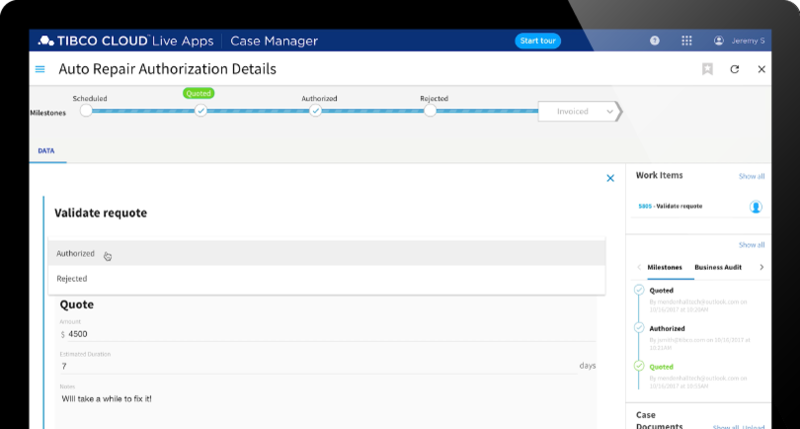 Watch as TIBCO Cloud Live Apps is used to extend claim processing with an application to answer business needs for insurers, partners, and subscribers. As it stands, to accommodate unique requests and changes, many insurers are still relying on numerous sporadic spreadsheets and emails to fill the gaps in current systems. This creates a scenario with no control over cost, processes, and approvals. Instead, Live Apps extends your existing claim process to empower claim adjusters and auto repair shops to collaborate on repair quotes and adjustments. Rather than having to work around current systems, or work backwards to handle customers, such as accommodating a specific repair shop, Live Apps allows insurers to easily handle the request in a clear, streamlined, and well-documented process. An insurer is then able to accelerate innovation and become more competitive.